Sounds just right for the title of a post about tatting doesn't it? The doily is Renulek's Summer. I was definitely not going to start another of her patterns as the last one seemed to take over my life! It seems as though I just could not resist. This is so not the colour you would expect as it reminds me of when I first learnt to tat 50 years ago, at that time coloured threads were scarce. However, I was given 8 boxes of Twilleys Twenty thread and although some of it has now gone to other people with more pressing projects, I still have a couple of boxes left. It is not the best of thread, a bit like rope so I am not sure if I will ever complete this doily. A large quantity of pop-a-bobbin shuttles are just about ready to travel to Jane's home, here are just a few of them. I will talk about some of the woods you can see in my next post, especially as there are some interesting stories behind them. 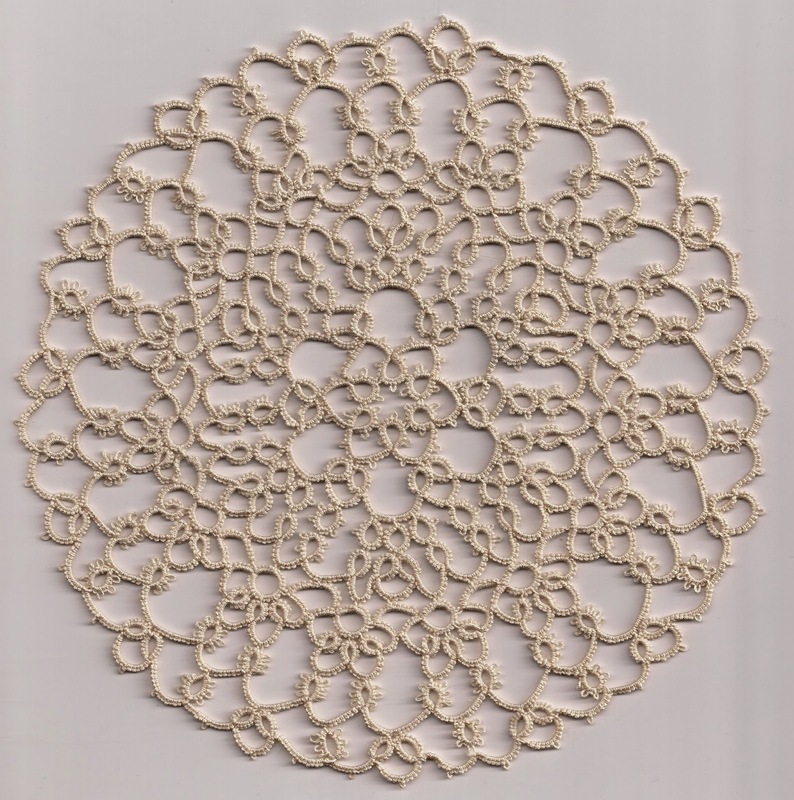 Well, thread notwithstanding, you have used it to great effect on this doily! And what a tempting assortment of timbers in that basket - what are the almost white shuttles? Maureen I think they must be pear. that's amazing!! - because I have a pear one, but it's varnished and looks quite different from these - they have been oiled instead? Yes all these shuttles have been oiled, still not sure whether it was a pear or a sycamore in the basket as that is also a lightish wood, can only tell you what they are when all packaged and labeled by the expert! wow you have been busy! every thing look wonderful! Yes our home is a hive of activity! I have a ball of Twilly's thread, but I haven't tried it yet. I love seeing the basket of Pop-A-Bobbin shuttles! Will I remember to jump in on the next sale? I hope so! The doily certainly looks good. Did you finish three editions of the Spring Doily? Well Jane the answer is no. I finished one, then stopped after round 8 with another and now on round 10 with the third one which I intend to complete before the end of Summer! I have not seen that thread since working in the wool shop. Twilleys is indeed like rope! Yes Fox so really wonder if I can last to the end tatting with rope! That's a lot of tatting, when you're not comfortable with the thread! You could easily stop here and call it finished, as it looks fine as it is. I'm amazed at all the thread manufacturers. Does Twilleys still make thread? That's a glorious assortment of shuttles and woods! Fantastic workmanship! I also could have been in that 'learned to tat 50 years ago' club if only I could have figured out those instructions in the Learn How Book, but even in magazines over the years (where tatting was rarely featured), I still couldn't understand what was happening with the drawings! I'm amazed I even learned in 1989, 25 years ago! I am not sure whether Twilleys still make this thread, although there is a lot of it on e.bay! I did learn to tat as a child, probably the best time really and that was from my grandmother. It was my grandmother and sister who learnt together, but our mother never took up the craft. Know what you mean about those drawings, they certainly are not very clear when you are starting out. 25 years is still a long time though for I must have had a break of 20 years or so when living abroad and tatting was far from my mind! PURPLE WOOD. Oh those are pretty.